The discount is the “win” of an ESPP because it allows you to buy stock for less than the market price. Most ESPPs use a discount percentage of 5-15% off of the market price. The best ESPPs “look back” in time to calculate an even better discount for employees. 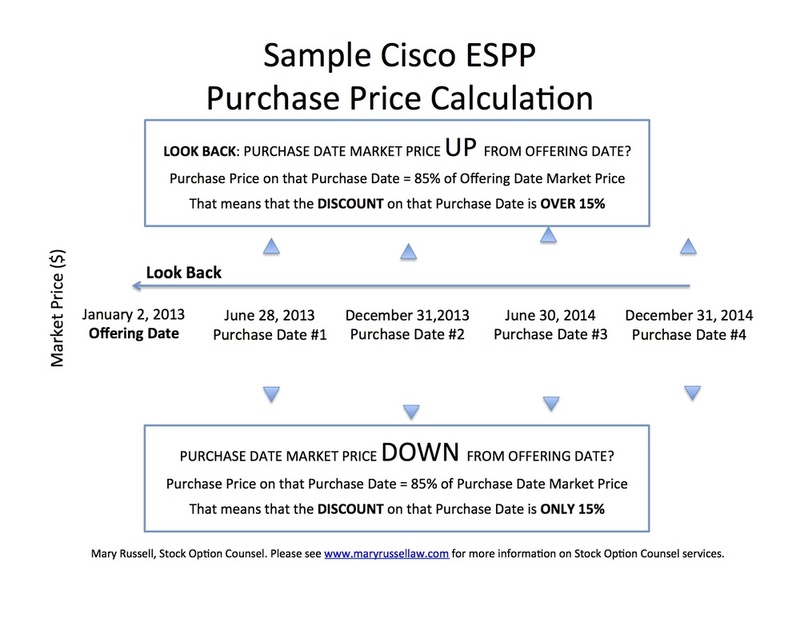 On the date of each purchase, an ESPP with a Look Back will calculate the purchase price by applying the discount percentage to the lesser of (1) the market price on a date months or even years before the Purchase Date (for Cisco, the Offering Date) or (2) the market price on the Purchase Date. A Look Back is valuable if the market price of the company’s stock is rising during an Offering Period, as purchase prices during that Offering Period would be calculated using the low market price of the first day of the Offering Period (Offering Date). For example, if the market price goes up from $10 to $20 over a tw0-year Offering Period and a company uses a 15% discount percentage, the purchase price on the last day of the Offering Period would be $8.50. That would be a discount of $11.50 off of the market price on that day. Cisco’s ESPP has a 15% discount and a two-year Look Back. Therefore, joining a Cisco Offering Period locks in the right to buy stock with a maximum price of 85% of the market price on the first day of that Offering Period. Even if the market price of the stock rises dramatically over the two years of the Offering Period, the employee’s maximum purchase price on each Purchase Date in that Offering Period is 85% of market price on the first day of that Offering Period. 2. 85% of the market value of the stock on the Purchase Date. Cisco Up Market Example: If the market price on the Offering Date is $15 and the market price on the Purchase Date is $25, the Purchase Price for that Purchase Date would be $12.75 – 85% of $15. That would be a discount of 49% off of the market price on the Purchase Date. If the employee sold the stock immediately after the Purchase Date, he or she would have a gain (winnings) of $12.25 per share. Cisco Down Market Example: If the market price on the Offering Date is $15 and the price has dropped to $10 on the Purchase Date, the Purchase Price for that Purchase Date would be $8.50 – 85% of $10. That would be a discount of 15% off of the market price on the Purchase Date. If the employee sold the stock immediately after the Purchase Date, he or she would have a gain (winnings) of $1.50 per share. Since the goal of an Offering Period game is to lock in the lowest possible Purchase Price, the Cisco ESPP automatically cancels any Offering Period after any Purchase Date on which the market price is less than the market price on the Offering Date. New Offering Periods start every six months, so participants are automatically enrolled in a new Offering Period starting after that Purchase Date. This lets employees take advantage of the lower maximum Purchase Price of the new Offering Period as the market price on the new Offering Date will be less than the market price on the cancelled Offering Period’s Offering Date.